it does with many other victims of the peevish, eccentric man, he is eminently competent and ambitious. The young Mangia lasted three months in charge of Palermo's senior team in 2011 (he had coached the U-19 club team before that), taking over from the departing Silvio Piola. "I hope Palermo becomes the Arsenal of Italian football, and Mangia our Wenger," gushed Zamparini on September 12th, 2011, a day after Mangia had led Palermo to a memorable 4-3 win over Inter. There were a few things to note following that victory: the serial-sacker Zamparini imagined the concept of patience for a short moment, Mangia defeated Inter on his first day in charge of Palermo's senior team , and he did it using a relatively simple 4-4-2 system. At 37, Mangia had finally arrived emphatically, gleefully hopping over the final threshold into the glare after an arduous coaching journey. The dust and heat of Italian football's sideshows--clubs like Varese and Valenzana was where Mangia had matured as a coach--had configured him for the big-show. He lasted only for two more months after that September when a loss to Catania prompted Zamparini to do what he does best: sublime destruction. Mangia got as close to Wenger's longevity as the Frenchman has to a trophy since 2005, but that was only a marginal detail. It was bound to happen in Zamparini's airless world. More importantly, Mangia saw his football ideas take discernible shape, and he grew in confidence. It is that confidence, and that 4-4-2 formation, that he has used so adeptly at the European Championships this summer. His Azzurrini play Spain tomorrow in the Final of the tournament, and up until now they have displayed a brand of football that is direct and decisive, premised on a passing game free of fear. They have defeated England with a wickedly misleading 1-0 scoreline (Italy's superiority deserved much, much more), swept aside Israel 4-0, outplayed Norway in a 1-1 draw, and edged Holland 1-0 in the semi-final after a visceral performance, one that was a case study of the brute force method: tolerate pressure, foul, stifle, and then assert yourself ruthlessly when you get the space. "This Italy has great quality," Mangia said after the semi-final. "We were better organized on the field, and we were balanced." While the semifinal didn't epitomize Italy's redoubtable qualities, their tournament as a whole has been scintillating. Napoli's Lorenzo Insigne has scythed grass and air with his incisive forays in midfield and the final third, Marco Verratti has been threateningly undisciplined sometimes, but an expert orchestrator most times, unlocking play from various positions in the field. behind them deftly. Borini did disappoint in the early stages of the tournament, but he scored the winner against Holland with a brilliant moment of improvisation. The backline has held together too, conceding only one goal, and that from a penalty in the 1-1 draw against Norway. Interestingly, Inter have contributed a good portion of the defence in goalkeeper Francesco Bardi, and defenders Luca Caldirola and Giulio Donati. But despite such raw material it is Mangia who has conferred upon the group a sense of organization and adventure, which can see Italy flourish their tournament with a victory over Spain. As coach of a country that has won this tournament a record five times, Mangia resorted to the prosaic in a moment when all were reaching for the poetic to describe Spain. "I don't mind if they [Spain] are the favourites because I know on June 18 there will be a green pitch, 11 players, a ball in the centre circle and we will start at 0-0," said Mangia, emphasizing the mundane details to calibrate his young team's nerves no doubt. "When we started the tournament I said to the players to take it step by step. Now we only need to take one last step." And rest assured Mangia will be aching to take another huge step after the one he took at Palermo. For a man who describes former Milan and Italy coach Arrigo Sacchi as his greatest influence, Mangia knows that it takes a pivotal moment, a pivotal few games, to be thrust into the elite. After all, it was Milan's Coppa Italia defeat to Sacchi's Parma in 1987 that led Milan owner Silvio Berlusconi to pick him as his coach. Mangia has achieved amply already, but a win will be consistent with his style. 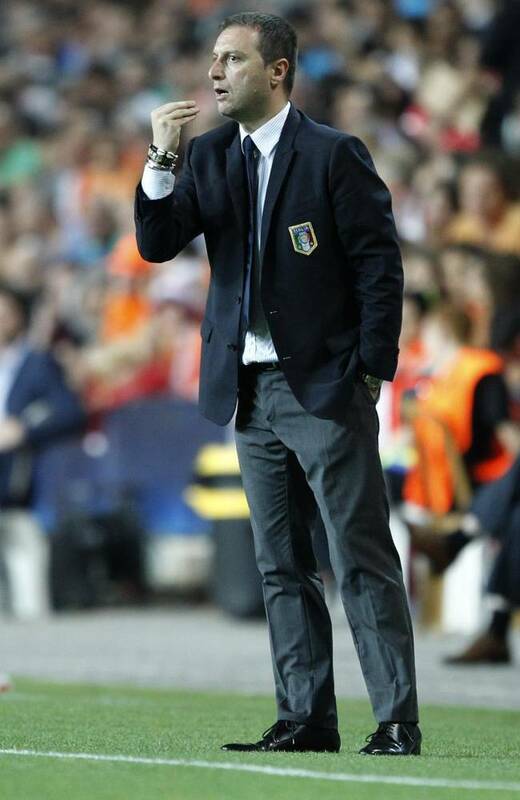 Ever since he took over this U-21 team from Ciro Ferrara last summer, he has blazoned it with daring. This Italy believes, and so does Mangia.